Downhill skiing or riding might be the main attraction, but Burke, Vermont offers plenty of outdoor adventures for beyond the lift ticket. A training ground for Burke Mountain Academy and blessed with more than its fair share of powder, Burke Mountain is a top destination for anyone who loves traveling downhill at top speed. Rub elbows with past or future Olympians (36 Olympians have trained at the academy, including gold medalist and World Champion Mikaela Shiffrin), or take your pick of numerous other outdoor activities in the Burke area—the adventure is yours for the taking. Make the swanky, yet relaxed Burke Mountain Hotel your basecamp and you can pick and choose from the best the region has to offer—and still come “home” to a soak in the outdoor hot tub or to enjoy a relaxing evening by the fire in your hotel suite. 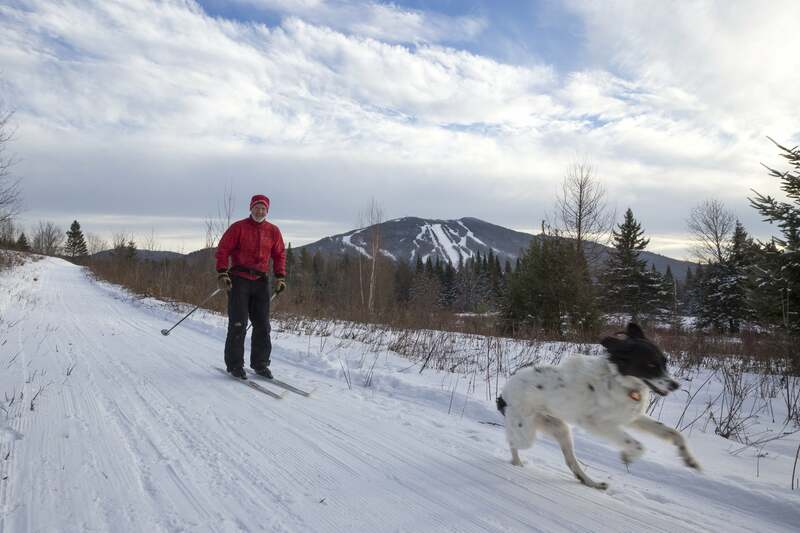 Skiing has always been a draw for visitors to Burke. But when Kingdom Trails—one of the premier mountain biking trail systems in the U.S.—first opened its cross-country ski trails to fat bikes made for riding in the snow, no one knew if this strange winter-biking craze would last. Almost a decade later, you can reliably rip 25 miles of single-track at Kingdom Trails. Take it from Burke area local Cathy Rowell, who loves the unique trail system: “Ribbons of white trail transport you to ethereal winter scenes, with mountain vistas, pine forests, and flowing river. My favorite place is the top of Webs in winter,” she says. “With the sun and snow on the trees, and no one else around, it’s magical and peaceful. There’s something for everyone here.” Rent a fat bike and get your pass at Village Sport Trailside, then head out for some two-wheeled fun. The ice climbing on Lake Willoughby isn’t for the faint of heart—“but the views of the lake are just fabulous,” says John Kascenska, owner of Kingdom Adventures Mountain Guides in East Burke. “It’s incredibly scenic, and has an exciting, high-alpine feel to it, as you’re far up above the road with the lake beneath.” (Keep an eye out for ice-fishermen below!) The pitches are steep and long where Kascenska climbs, and some require a mix of rock and ice climbing. But if you have a little experience under your belt and are game for adventure, seek out the cliffs on the Mount Pisgah side of the lake, where the sun tempers the frigid temps. 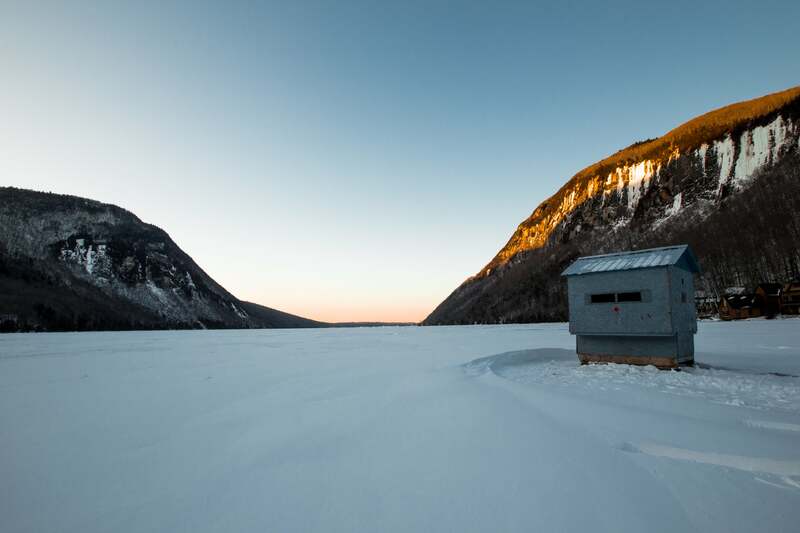 Lake Willoughby is only 20 minutes from Burke Hotel, so you can easily ice climb one day and ski the next. Backcountry skiing—or the art of skiing up, not just down the slope using special adaptable bindings and sticky “skins” you affix to the bottom of your skis—has exploded in Vermont in the past few years. As more and more skiers realized that deep, unskied powder could be harvested with just a little extra legwork, backcountry routes started springing up across the state. The newest uphill/downhill routes are on Mount Hor, in Willoughby State Forest, where volunteers from the Northeast Kingdom Backcountry Coalition partnered with the Vermont Department of Forest, Parks and Recreation to create a handful of new glades for ripping pow. But here’s a tip: you can also earn your turns right at Burke Mountain, where a liberal alpine touring policy allows you to harvest pow from the entire 178 acres of mountain—not just the groomed trails. Prefer not to have to dodge trees on your off-piste adventures? 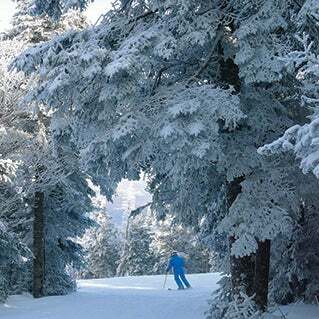 Try gliding silently through the trees via machine-groomed trails on a pair of Nordic skis. 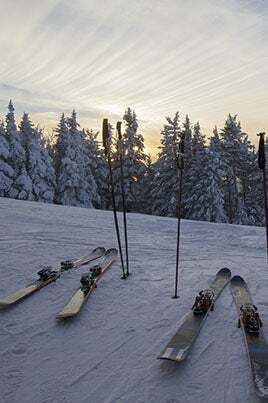 Dashney Nordic Center, located just off of Mountain Road (there’s a free shuttle from the hotel), offers rentals, lessons, and 12.25 kilometers of groomed trails for those looking for self-propelled skiing unaided by gravity or chairlifts. 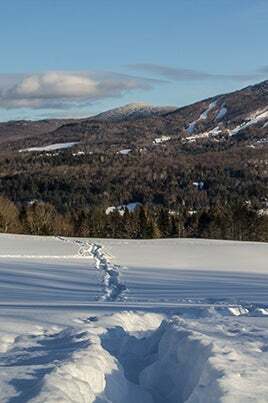 For stunning views of Willoughby Gap punctuated by red barns, quaint inns, and rolling pastures, the Kingdom Trails Nordic Adventure Center on Darling Hill Road grooms 15 kilometers of ski trails. Don’t miss an opportunity to grab a post-ski beer or espresso at the Village Sport Shop Trailside upon return; while it looks like a bike shop from outside, you’ll find several local brews on tap inside—and there’s often a fire roaring outside, so grab a loaner blanket from the shop and enjoy a winter sunset over the mountains before heading back to your room. Burke claims to get more than 200 inches of snow annually (the nationwide average is about 25), so if you like to hike, plan on using snowshoes. Rent a pair of the wintery floatation devices at Dashney Nordic Center, or take a tip from Newark resident Chris Gagnon, who runs the Wooly Buggah Barn with his wife, Katie Losito, and heads to Lake Willoughby for trails that he says are “quiet, peaceful, and include great views of the lake.” On the western side of the lake, the summit of Mount Hor is only 2,648 feet, but looks out over Lake Willoughby, and, on a clear day, includes views of both the Green Mountains and the White Mountains. At 2,751 feet, Mount Pisgah, on the opposite shore, offers distant views of the Whites, as well as partial views of the Greens and Lake Memphremagog in the distance. Either way, consider renting snowshoes with built-in crampons: “Those trails can be kind of steep,” Gagnon says. Rev your engine on the VAST trails. Your first clue that you’re entering the realm of the Vermont Association of Snow Travelers are the mini-sized stop signs cropping up on the side of the main road. The next tip-off will be the roar of four-stroke engines. But don’t turn up your nose at the snowmobilers ripping along the snow-covered trails criss-crossing the whole of Vermont until you see the smiles beneath their face masks. One of the oldest snowmobiling clubs in the U.S., VAST maintains more than 5,000 miles of trails across the state—and some of the best riding is in the Northeast Kingdom. If you don’t have your own machine, rent one from NEK Adventures in St. Johnsbury. The two-hour tour and rental includes safety training, a helmet, and a guide who knows where best to let your engines roar. Just be sure to bundle up; you can rent a snowsuit from NEK Adventures, but plan on wearing all of the layers you own under it—riding the wintery wind is a frosty endeavor!